These are "opened box" units that may or may not be lightly used. Either way, we have checked all the parts and replaced any non-functional parts so the MotoTote is fully functional and complete with all hardware. Inspected & re-boxed. Some parts may have scratches, minor dents, cosmetic damage but no damage that would affect proper function and use of the product.This product is fully covered under our new product warranty excluding cosmetic damage. The Moto-Tote m3 is the latest generation of our best selling motorcycle carrier for dirt bikes and scooters weighing up to 450 lbs. Can also be used for light street bikes with rear tire width of 6 inches or less. 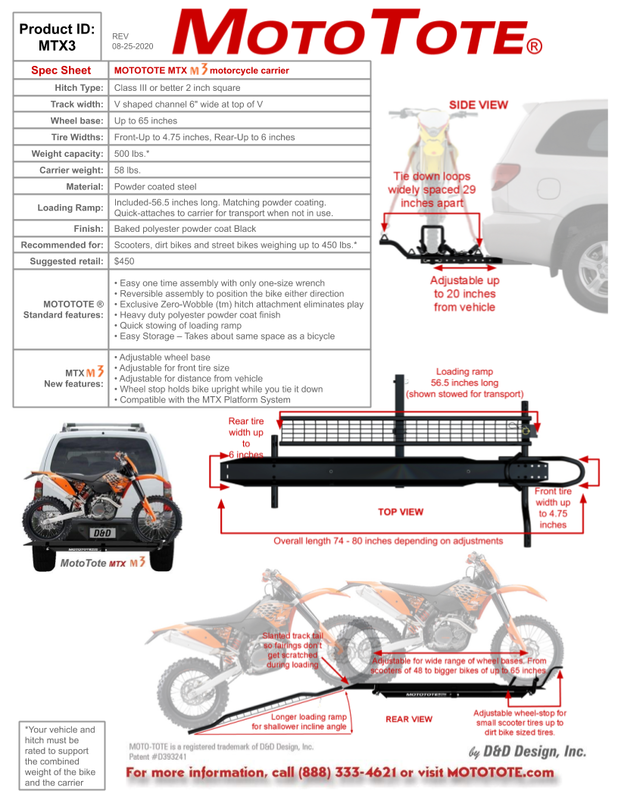 The Moto-Tote MTX carriers are built on the MTX Platform which is a large diameter tube beam that provides structural support for all critical components of the motorcycle carrier. Everything is bolted to this platform: Tie-down arms, tire track, wheel chock assembly, etc. This construction provides superior strength and structural integrity. Was fairly simple to assemble following directions. Scooter was easy to load and unload. Did not bottom out because ramp is well designed. Good quality. Very happy with this model for our Zuma on the back of our RV. Prior to purchasing my own carrier I had a chance to borrow a MotoTote from a friend (Thanks John). I did a 900 mile road trip to Utah and also used it almost daily for 2 weeks while clearing trail for the forest service. Secure, easy to use and robust as all get out with a very nice finish! On forest roads I came to appreciate the rise manufactured into the front tie down as it provided extra clearance for traversing washed out roads. Never experienced any difficulties and never had the handle bars strike the glass of my camper shell. Nice attention to detail in the design and manufacture of the carrier. The welding is superb! This is just the best carrier on the road! Only suggestion would be for MotoTote to consider offering an overcenter front wheel lock in place of using the tie downs. Reduces the length of the setup on the truck, relives the pressure on the front suspension and would make for a faster load/unload with less things to keep track of. I will weld the hooks on my compression straps into eyes that cannot be removed from the carrier to prevent losing them at an unfortunate time. After making the mistake of purchasing, assembling and (thankfully, on the ground) fitting my bike into a less expensive rack recommended for my RV/bike combo by Camping World, the rear tire was too wide and got stuck and the ramp was too short to avoid bottoming out a cruiser type bike while loading. I exchanged it and purchased the Mototote MTX M3 that was not only a perfect fit and a longer ramp but the advice & service I've received from Marvin via email & phone is exceptional! The carrier holds my Yamaha V-Star solidly and easily and my fear of driving cross country in a 35ft motorhome with a 330lb m/c "hanging on a stick" has been greatly alleviated even prior to the big trip. In my test drives it's been fine and solid and I'll keep you posted as our actual journey unfolds soon. PS-the reboxed M3 I purchased arrived without a scratch and all hardware was there and perfect. If it wasn't brand new I wouldn't know. Only problem I've experienced is the pin to lock the ramp in place is unable to slide through its hole due due a slight arch in the ramp. Nothing I cannot repair or live with since I'd lock it more securely anyway. Final word of advice...if you're hauling a cruiser style bike don't even think of any other carrier but Mototote. For me to take time to review something, it would have to be a great experience. Marvin answered all my email questions I could ask in a timely fashion, amazing customer service. Best I have ever seen. The product is amazing. Bike loads right up, no movement at all. I never even turn around to take a look in the mirror. I had a cheap aluminum one at first, returned it and got the MotoTote. Best decision I have ever made. So well built and easy to use. Thanks Marvin!!!! It's strong,light and easy to use.